Home / Event / The Germans Are Coming! Every year, for the past few, I’ve headed out of town with friends to the beautiful mountain destination of Big Bear. Up in the mountains east of Los Angeles, this green, cool, and relaxing town is the perfect getaway for anyone living in the area. 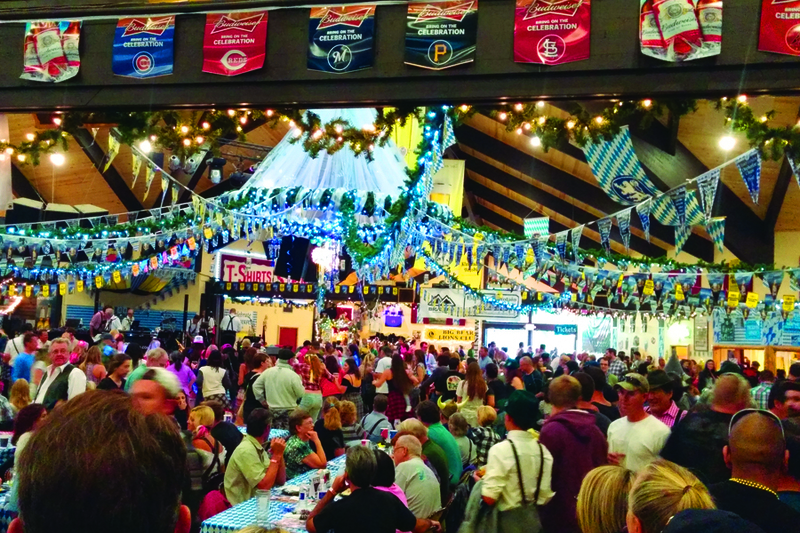 Especially if that getaway includes a festival with German beer and food. With fresh mountain air in my lungs and a cool 32 oz. glass of Franziskaner Weissbier, I walked the festival grounds with friends, taking in the oompah music, USA v Mexico Soccer, and lots of dancing festival-goers who all pretended to be part German for the day. It wasn’t long though until the smell of food caught my nose and I was hungering for the some classical German food. And of course for a festival like this, and a sandwich connoisseur like myself, the go-to option is always Bratwurst. As I’ve said before in my grilling posts, when I cook sausages on the grill, I always love to keep it simple. Sauerkraut, onions, a little mustard, that’s all you need to highlight the flavors of the sausage. But Oktoberfest went a little nutty. 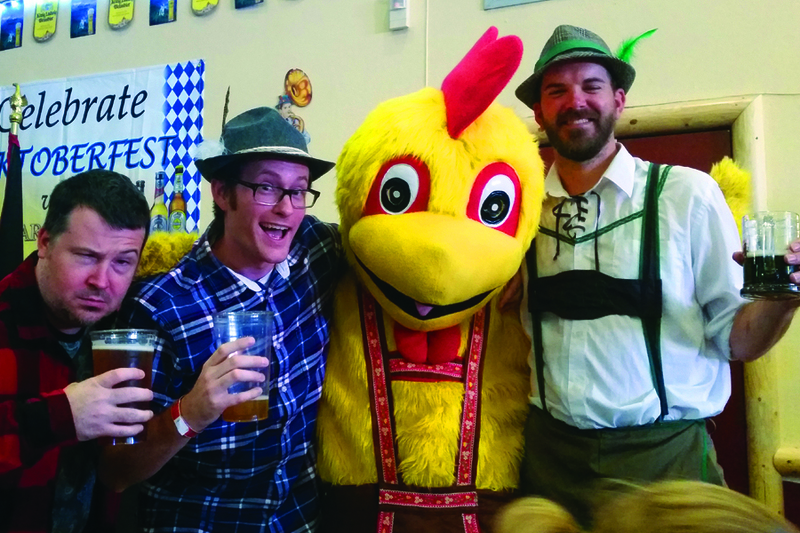 Oktoberfest got a little bold. Oktoberfest added bacon and Sriracha. Let that one mellow in your mouth for a minute. If you picked up German street food outside of an Asia food distributor in Berlin, you’d end up with this. 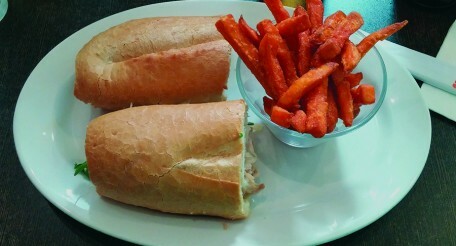 The brat was mellow, full of meaty flavor and savory from the pork. The bacon added its smoky mellowness that simmered beneath the ingredients. No Sauerkraut here to bring the tartness, instead you’ve got the vinegary spice of Sriracha. And you know what? Even though it’s styling itself off of a Street Dog, the combination of double pork and flaming rooster really worked here. Mellowness with spice and vinegar work well together. 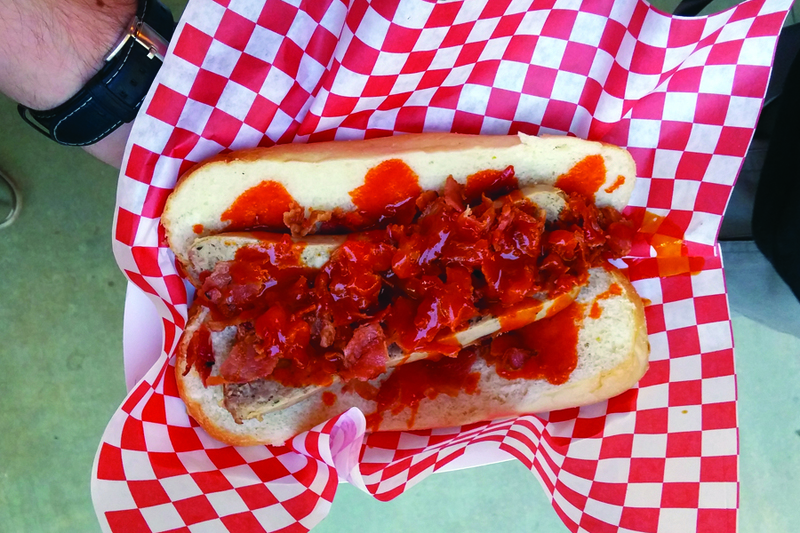 Obviously the Sriracha stood out with its bright flavor, but it was easily complemented by the mellowness of pork brat and bacon. In the end, it got me thinking for when grilling season begins again. Just kidding, it hasn’t ended in Los Angeles yet. But if you’re looking for a great getaway weekend in the LA area, a time when it should be cooling off in the city but doesn’t, look into getting away to Big Bear for Oktoberfest. It’s a great break from the hustle and bustle of LA. And every time I go, it seems I find more and more sandwiches worth repeating.